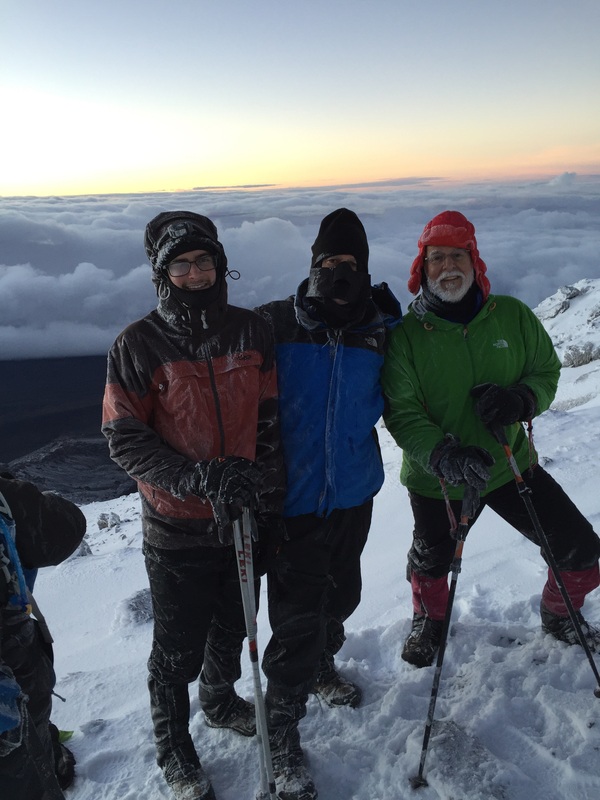 We were awakened at 11 pm to begin dressing for our ascent and with one peek out the flap of the tent it was readily apparent that this was not going to be a typical night on Kilimanjaro. The wind was blowing strongly and there was a driving pelt of hail or frozen rain quite audible as it struck the sides of our tents. Three layers on the bottom and four layers on the top. Check. Two pairs of socks. Check. Gaiters. Check. Lots of water in our Camelbaks. Check. Headlamp with new batteries. Check. Gloves. Check. Balaclava and hat. Check (except my hat was still wet from the day before so Dickson loaned me one of his). We all met in the mess tent and the guides checked individually with each of us to assure them we had everything we needed to make the climb. We’d come a long way and so far everyone had dodged any hint of altitude sickness of any significance. We’d been very lucky. We stepped out of the mess tent at midnight as had been planned and entered into a world we hadn’t quite anticipated. The trail is usually clear all the way to the summit with perhaps a dusting of snow at times. What we encountered was a blinding snowstorm with strong winds and low visibility that left your entire world as the small patch of trail illuminated by your headlamp and the knowledge that we were being led by skilled guides. When I tell you that it was cold, it does not give it justice. We all had hand warmers in our gloves, some with double gloves and most with toe warmers in their shoes. Our fingers and toes still froze almost immediately. My Camelbak, which has an insulated hose on it for skiing, froze within half an hour and was useless until well into my descent. We trudged up snowy switchbacks that seemed endless, one foot in front of the other, taking two breaths for every step at times. What you could see in front of you, though, was the endless line of headlamps of other climbers who had left earlier than us, many of whom we would soon catch and pass, which was a treacherous feat given that the trail was wide enough for only one to walk. We followed our guides, though, wherever they took us as our lives were now literally in their hands. This was tougher than I could have ever imagined or had ever done before. Tougher than jumping out of a plane, driving 150+ mph on a race track, diving 100+ feet underwater, or anything I had done fighting forest fires in the Sierra spending sixteen hours cutting fire line in the blazing heat. None of us had prepared ourselves mentally for this. We relied on each other for the strength to continue and had I been with strangers I don’t think I could have continued. Nick felt ill most of the way up and Lindsay and Danielle were bastions of willpower the entire climb. Jeff and I just kept pushing ourselves and reaching deep down for what it took to make it to the top. What should have been a five hour climb to Stella’s Point, ended up as seven and half hours and put us behind schedule. The sun had come up just below Stella’s Point and even though it was only for a brief moment, it gave us that extra strength to push it to the top. 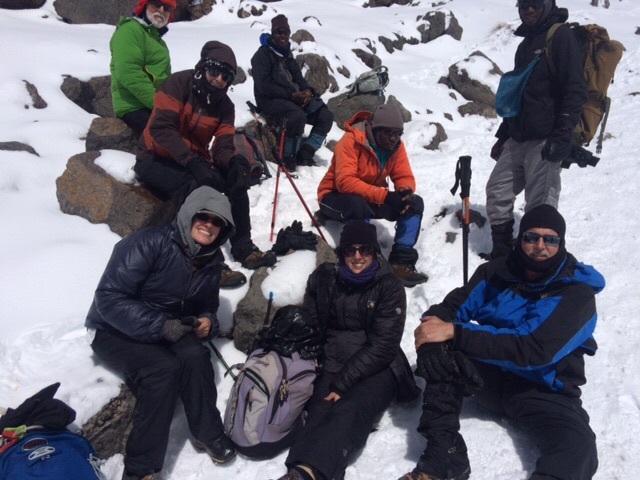 We regrouped at Stella’s and began our “walk” to Uhuru Peak. 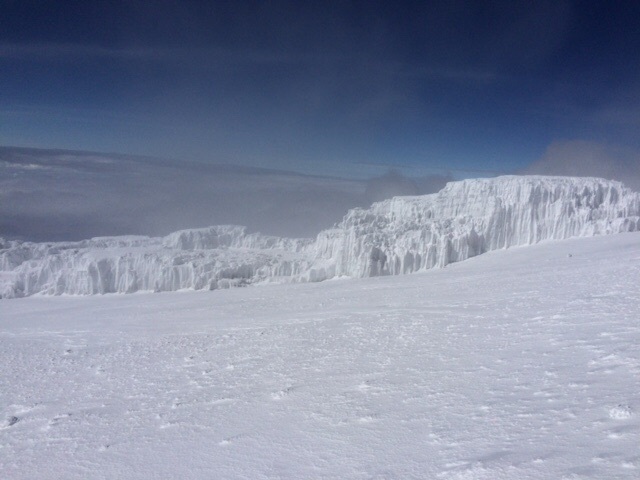 This was no piece of cake, either, as there was easily over a foot of snow on the crater rim and the winds were whipping us at we all felt had to be greater than 50 mph and were pretty constant. Fellow climbers were now passing us on their way down giving us words of encouragement that we were very near our goal. I took whatever strength I had left and just kept walking with Danielle behind me and we somehow separated ourselves from the others making it to the top with our guide a few minutes ahead. It was so surreal to finally be there at the top of Africa. The visibility was now improving slightly and we could see forever – across the clouds to the south and west and into the crater far below to the east. The wind was still dramatic as was the temperature and we needed to begin our descent fairly quickly as everyone was feeling the extreme effects of the weather at this point. 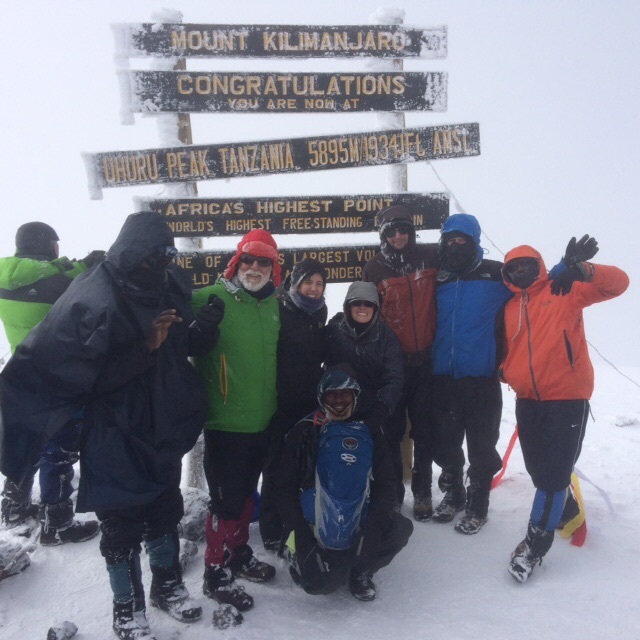 We hugged and congratulated and cheered and took our group photo at the summit, after clearing all the snow from it, of course. My camera, all 3+ lbs of it that was lugged to the summit was useless as the battery was completely dead in the frigid cold (only to recover back at base camp). Our summit photo, though, doesn’t come close to conveying the amount of pain each of us had suffered to get us to that point. We summited at 8:30 am, a full two and a half hours behind schedule! As every climber knows, a successful ascent requires a successful descent. Now, we had to get down off this mountain! The descent trail is a different trail that doesn’t switchback and is normally a piece of cake in the dry conditions normally seen on the mountain. There was now a good foot of fresh snow, slush and ice atop the trail making it a real challenge. I had the hardest time as I’ve never liked going downhill on slippery ice and snow, unless of course I have skis on. I will tell you my experience getting down, but I know everyone had some trouble with the descent. Each guide took a group and Emanuel stayed at my side, arm in arm, for at least half the way down until two of our porters met us and also helped. Emanuel was exhausted as each time I stopped to gather myself he was then sitting briefly which I had never really seen him do before. Soon Dickson met us with some fresh pineapple juice for me to drink and joined our group helping me down to camp. I explained to them what the word “entourage” meant – I trusted them with my life at that point. I finally convinced them to let me walk on my own for the last hour back to camp, but it took some doing as they all wanted to help so much. They were certainly my heroes. I walked into camp at perhaps 1:00 pm while the others made it down a bit before me. We were wiped out to say the least. The plan had been for brunch, which was now going to be lunch, and to hike to the lower camp on the trail that afternoon. Ema changed that to the higher camp which was only to be a two hour hike. We rested for a little over an hour, had a wonderful lunch and then broke camp. The hike to the Upper Mweka Camp was entirely uneventful other than the fact that we were all wiped out as we had been climbing since midnight with only a short break. We dined our last incredible dinner and all went right to sleep, having absolutely no energy remaining in our bodies. 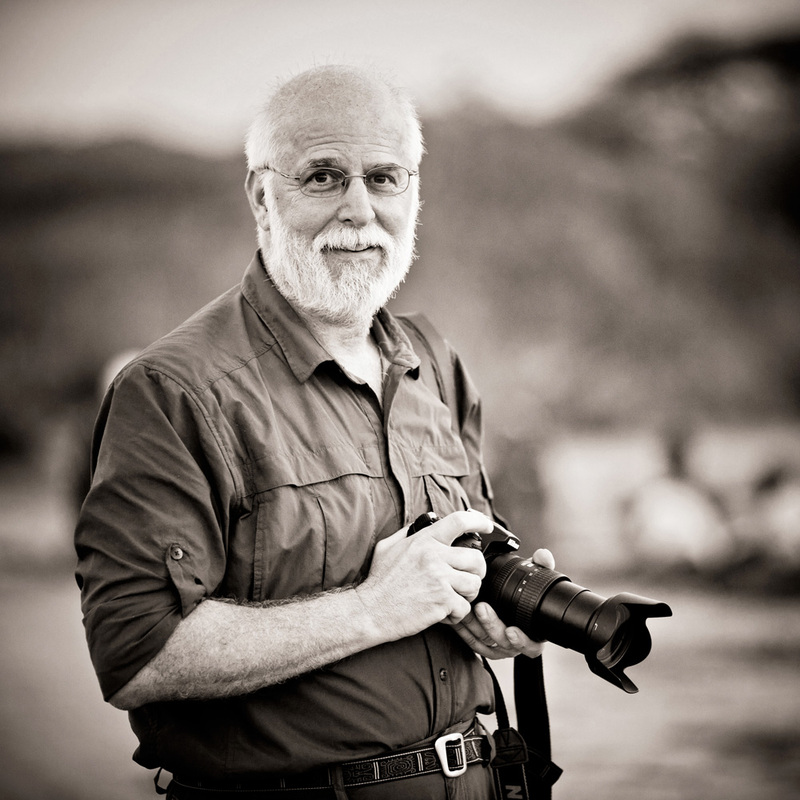 Tomorrow we would descend the Mweka route to the Kilimanjaro gate and be picked up for our ride back to Arusha.